Touted by many as a favorite season, Autumn is in full swing! The leaves are exploding with color and the temps are changing – bringing the cool crisp air of the season. Savory Foods. This harvest season gives plenty of pleasure to the taste buds! Pumpkins, squashes, apples and mushrooms are just some of the great foods harvested at this time of the year. These super foods can be incorporated into a whole host of baked goods, soups, stews, and sides. Hot Drinks. Not to mention seasonal goodies like Pumpkin Spiced Lattes, hot caramel apple cider, mulled cider, and the ever child-friendly favorite: hot chocolate. Who doesn’t enjoy a warm drink respite after a day spent raking leaves or picking out pumpkins? Fall Festivals. Apple orchards, pumpkin patches and harvest festivals abound at this time of the year. With the sweltering summer temperatures behind us, running through a corn maze with the kids or picking a bushel of apples give us ample opportunities to enjoy the outdoors. Football. It’s kind of a big deal. We love to don our jerseys, bundle up, pack our cars with tailgate supplies and road trip to cheer on our favorite teams. Cozy Clothes. It’s time to put away the summer dresses and sandals. Instead, we’re pulling out our thick, warm and comfy clothes. 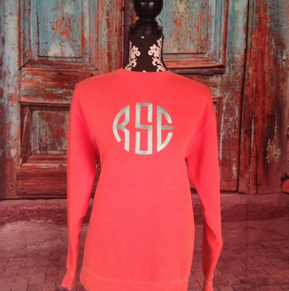 A monogram pullover is a great way to keep warm and stylish at the same time. It’s also a fun time for accessorizing – a beautiful scarf or a new pair of boots can make us look and feel great. Fall is the season that brings the senses alive: with its vibrant colors, decadent smells, warm touches and happy memories it truly is a season to be cherished. So, get out there! Take time to warm up with family around a bonfire or feel the crunch under your feet as you walk in an apple orchard or cozy up with a thermos of hot cider in your favorite pullover under Friday night lights. Just found you on line. Spent hours going thru merchandise. I am hooked and want one of everything. Waiting to order November birthday gifts for a friend. Thanks for so many options. I got your web site from a friend whom had ordered a pocket book, I ordered myself and my daughter a pocketbook, loved the bags and have been showing them off and tell everyone the name of your site. I had the best Birthday this year not only did I get the Monogrammed pocket, but I entered your Giveaway, and WON the Monogrammed T-shirt.